So I have made "sausages" once - I even ground my own pork and seasoned the meat. The only problem is that I could NOT find sausage casing anywhere so I just hand formed them kind of into a sausage shape - hence my calling them "sausages". In any event this time I took a short cut thanks to a lovely old lady I meet in the grocery store (yes you will notice a pattern of me finding out a bunch of cool things by talking to people in the grocery store)... Anyways she showed me where they had unseasoned sausage meat in the frozen section of the store - balk all you want because it is frozen and not fresh - but honestly for something like this where I'm thinking more about technique and getting it to work rather than anything else I was thinking of grinding my own meat (I will do that one of the times I make them). So sausage rolls are in essence really simple - sausage meat housed in puff pastry. However, I definitely consider this a learning experience in the overall technique for making this because it is a little more complicated than putting meat in puff pastry. 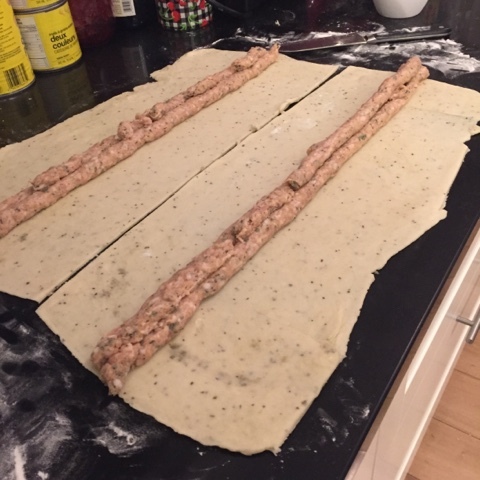 I did make the puff pastry from scratch - and this was my first issue - not making the pastry itself but finding my recipe for making the pastry. I have heard and found that a lot of things call for the pre-packaged dough. However, I have made puff pastry before and it's not that complicated so I don't know why I would buy the pre-packaged puff pastry any more unless it was really a time crunch. Ever have this problem - make a delicious recipe and forget where you have, found or keep the recipe? I'm finding this to be a huge issue and I need to find a way of starting to manage this issue given the number of sources I have. I will recommend the app "MealBoard" it is where I keep most of my recipes - especially the ones that I find online - it also makes it really easy to check what things you might need for a recipe if the inspiration hits you in the grocery store. It also allows you to meal plan, create a grocery shopping list, import recipes or send a copy a recipe easily. Waiting to be wrapped up! Cut 8 ounces (2 sticks) butter into 1/2 to 1/4 inch dice, place on a plate and refrigerate while preparing remaining ingredients. Measure water and add salt; stir to dissolve and set aside. (Note: I cut the butter lengthwise four times then stack this slices again, turn over cut into four lengths along the other side so basically you'll end up with 16 long sticks of butter and then I cut the sticks into smaller cubes. I also usually take butter right out of the freezer for this or I put the butter in the freezer before I cut it and after I cut it to keep it really cold). Coarsely dice the remaining 4 tablespoons (1/2 stick) butter. Place flour in work bowl (of food processor fitted with metal blade; add 4 tablespoons of butter and pulse until butter is absorbed - about ten to twelve 1-second pulses) or do like I do and use a pastry knife and cut the butter into the flour. Add the remaining butter and pulse once or twice to distribute. Add water and pulse 3 or 4 times, just until dough forms a rough blah. Do not over-process. Flour work surface and scrape dough from work bowl. Shape dough into a rough rectangle and places between 2 pieces of plastic wrap. Press sought with rolling pin to flatten, then roll back and forth several times with rolling pin to make a 12 x 18 inch rectangle of dough. Peel away plastic wrap and invert dough to floured work surface. Peel away second piece of wrap. 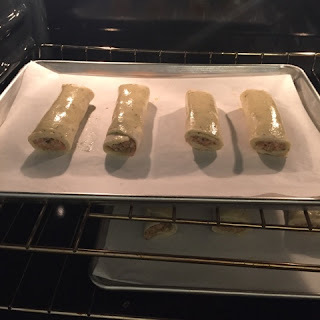 Fold dough in thirds in the width, folding the top third down and the bottom third up, to make a 6 x 18 - inch rectangle, then roll up the dough from one of the 6-inch ends, making sure to roll end under dough. Press the dough into a square, wrap in plastic and refrigerate 1 hour or until firm. In the oven on the way to being tasty! I mixed all of the above ingredients into a bowl and then I cooked off about a tbsp size ball just to test my seasoning and adjust the seasoning in the mixture. I also used onion powder in place of onion because of the husbands issues with texture. Normally I would have finely diced 1 small onion and then sweated the onion for about 3-5 minutes maybe with some garlic (now don't tell him - I probably will do that next time shhhh our secret). I then loaded the mixture into one of my disposable pipping bags with a large round tip (can't remember the size off hand). Once that was ready I pulled out the puff pastry and rolled it out. 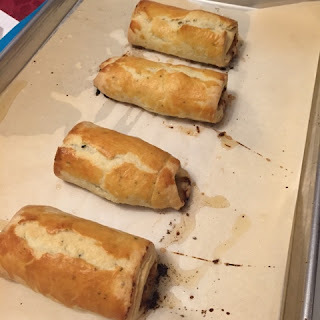 Now here's the first issue - I wanted the pastry thin which is a good thing but I think I went too thin or used too much - because after I piped out two strips on each half of the pastry I ended up rolling the pastry around the filling - bad idea - left too much pastry. I then used egg wash to seal the edge of the pastry as I wrapped it and then popped it into a 350 oven for about 20+ minutes - we used an instant read thermometer to make sure the meat was fully cooked.